Day three of the Roma Wish Mission trip to Beards Fork, West Virginia, a community of one hundred and nine people. The team began with breakfast and then a meeting to go over the daily agenda. Our typical morning starts with a daily message followed by each of us sharing our thoughts on what had touched us from the prior day. Tony shared his message, which was surprising because we thought it would be directly about the mission work. It was actually about the personal emotional connections to the people we have helped during our time here, rather than simply the work itself. Nik also shared his thoughts where he talked about what we each learned from the job site each day and encouraged us to apply it to the next day’s assignment. We were all very eager with anticipation to see what the day would bring and explore what connections would be made. 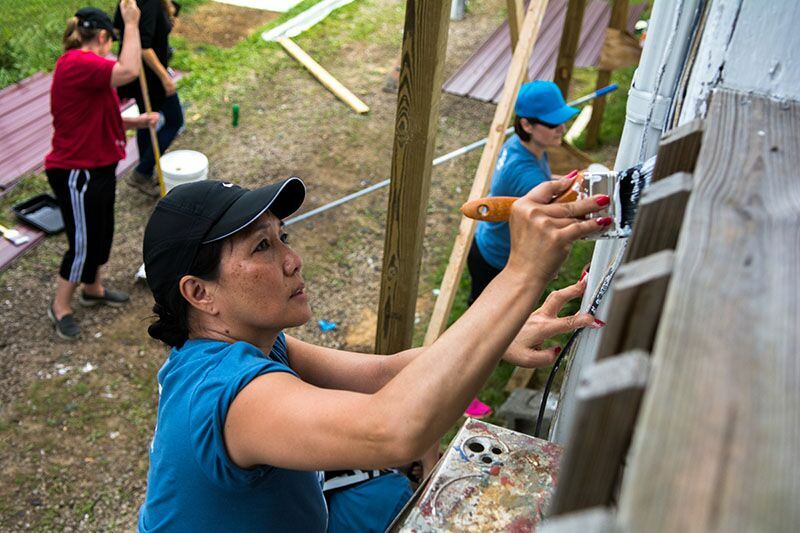 Veronica, Bob, Tania, Adrienne and Olga went to paint a home that the team had started on the day before. Veronica and Olga were working for the second day at this site and were eager to continue painting. The great thing about painting is the immediate gratification you receive as you see the project come to life. The painting site manager Steve knew a great deal of interesting facts about Canada that impressed all of us! He enjoyed joking with us and he realized that we were on to his dry humour. He requested we help find him a mail order bride from Canada, but we told him that was more of an overseas thing. Curtis, another one of our site team members is a wealth of information on the local area. He is passionate about old school music, performing acoustically in local bars playing guitar, for his fiancé and his local community. The painting crew all sang “The Gambler” by Kenny Rogers, sitting on the front porch, led by Curtis who loves the oldies as he shared with us. This was a moment that can never be recreated as it was organic born out of a mutual love of music between all of us. Sometimes you got to know when to hold them and when to fold them. Tony and Kim worked at the Oak Hill School where they met with Jessie. We mopped and scraped the floors on the first floor. After lunch, Tony requested a school tour so we made our way up to the second floor. We walked into the school auditorium where there was a beautiful grand piano on a wooden stage. The stage looked out over a sea of antique wooden fold-up chairs. Taking our imaginations to years back, we thought about the many performances that had taken place on that stage, while audience members sat attentively in those surprisingly comfortable, aged wooden seats. As we finished touring the auditorium, the team made our way up to the third floor. We had heard stories about noises emanating from the now-vacant classrooms, which were filled with chairs and other items piled to the ceilings and lockers filled to the top with donated books. With our heads all filled with the stories of the noises, it was so surreal, when we all experienced and heard them, ourselves. This was just like it would have been from a scary movie scene, we got goose bumps and our hair on our arms stood up. Lloyd and Carolyn went to work with Miss Brenda to assist her at the Regina apartments with administration and advertising. They were also able to help in the unloading of a truck full of food donations given by local businesses to be distributed to the community in need. We all learned that it was not about how much paint we put on the walls, or the scraping or cleaning of the floors nor the time it took us all to do these tasks; but rather it was about letting those around us know we truly cared about them. We did this by listening to their stories and taking the time to get to know each of them on a personal level. It was about the homeowners being proud of where they lived. It was about the other volunteers who shared their personal journeys, where many times the struggles they have met along the way have not always been easy ones. It was at its core about personal and emotional connections. We are blessed to be able to share with you our recount of yet, another wonderful day in the community of Beards Fork, West Virginia.